Located in beautiful downtown Delaware, OH, we are Delaware County's #1 source for a wide variety of athletic apparel, specializing in running shoes and apparel. We also have shoes, apparel, and accessories for soccer, football, baseball, softball, volleyball, cheerleading, walking, and wrestling! In our store you will find all major brands including Nike, Adidas, Saucony, Hoka, Asics, Mizuno, Brooks, Under Armour, Enell, BodyGlide, Endurox, Feetures and many more! Ask us about team pricing! The Best Selling Running Shoes in the Country! 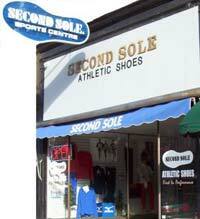 We carry the top selling running specialty shoes, apparel and accessories from the finest manufacturers. Brands include Asics, Brooks, Mizuno, Saucony, Hoka , Nike, Adidas, Under Armour, FuelBelt, Balega, Feetures, Powerstep, Spenco and others ensure a wide selection. Asics has been the go-to brand for runners for many years and offers cushioned support in a shape that fits like a glove. We carry their best selling models. Stop in to try on them on! Mizuno offers great performance oriented running shoes utilizing their Wave technology. They offer a light weight, highly responsive ride with just the right amount of cushioning. Stop in and try them out! Brooks makes some of the finest running shoes in world. The Brooks Adrenaline GTS has become the country's top selling model with just the right amount of support and cushioning for many people. Try them on today! A perennial favorite, Saucony offers a great blend of cushioning and support with light weight. Slip a pair of Saucony's on for your next long run or walk in the park, and your feet will thank you. A relative newcomer to the running world, Hoka One One is best known for featuring oversized outsoles. Often dubbed as "maximalist shoes", due to extra cushioning. Try on a pair and see why they are the fastest growing running brand! Enell sports bras set the standard for women that need maximum support. Mentioned as one of "Oprah's Favorites". This sports bra has been used by contestents on The Biggest Loser TV show and has been featured in many magazine articles including Runners World, Self, O, Newsweek, and Her Sports. Stop in to try one on today.